Courtesy of Coldwell Banker Pacific Prop..
A pedigreed past and artistically renovated by the current owner, this one-of-a-kind compound combines European detail and the comfort of the islands to create a quiet refuge like no other on Kahala Avenue. No expense was spared in the original construction and attention to details in this Palatial oceanfront estate. Beautiful manicured grounds, circular driveway, grand entrance, theater, all-tile swimming pool and spa with amazing sculptured water feature, the oceanfront lanai is 4,000+ s.f. and runs the entire length of the home. One of the most amazing oceanfront estates to come on the market in years. Please, send me more information on this property: MLS# 201829046 – $30,000,000 – 4505 Kahala Avenue, Honolulu, HI 96816. 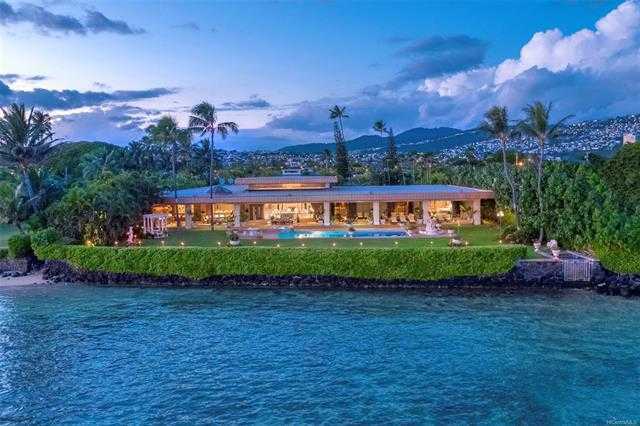 I would like to schedule a showing appointment for this property: MLS# 201829046 – $30,000,000 – 4505 Kahala Avenue, Honolulu, HI 96816. Based on information from the Multiple Listing Service of Hicentral MLS, Ltd. Information is deemed reliable but not guaranteed. Some of the active listings appearing on this site may be listed by other REALTORS®. If you are interested in those active listings, our company may represent you as the buyer's agent. If the active listing you are interested in is our company's active listing, you may speak to one of our agents regarding your options for representation. Copyright © 2019 HiCentral MLS Inc. All Rights Reserved.